This photo taken by the South Dakota Civil Air Patrol shows flooding in western Iowa, along the Missouri River, on Monday. Now as they watch the new lakes that overtook their property slowly recede, some have a painfully long time to reflect: They lost so much, staying in business will be a mighty struggle.Across parts of the Midwest, hundreds of livestock are drowned or stranded; valuable unsold, stored grain is ruined in submerged storage bins; and fields are like lakes, casting doubt on whether they can be planted this year.Historic, widespread flooding will continue through May, NOAA saysThese are especially cruel times for Nebraska and Iowa farmers who had to scrape money to keep going just eight years ago, when floods overtook their lands in 2011.”I would say 50% of the farmers in our area will not recover from this,” Dustin Sheldon, a farmer in southwestern Iowa’s flood-devastated Fremont County near the swollen Missouri River, said this week. 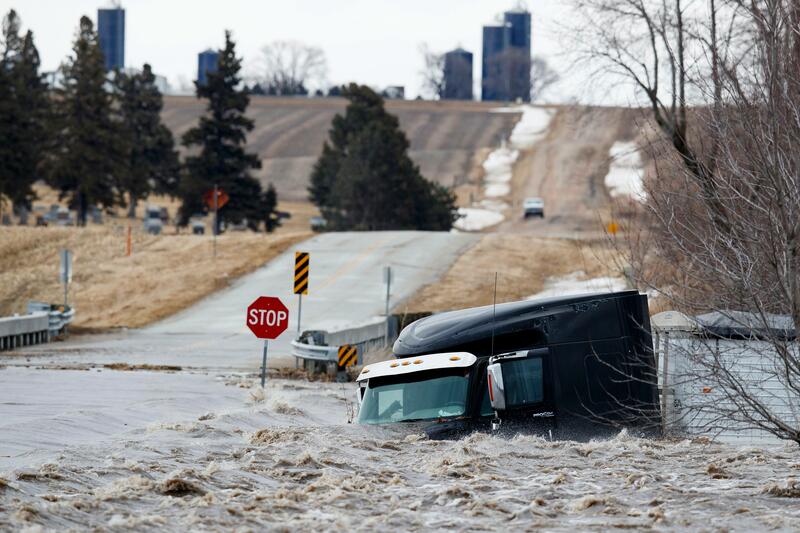 Floodwaters washed over the Plains and Upper Midwest as a bomb cyclone dropped heavy rain and snow last week, and as previous snow and ice melted.Nebraska Gov. Pete Ricketts called this the “most widespread disaster we have had in our state’s history.” Officials expect their initial farm damage estimates — $400 million in damages to crops, and $400 million in lost livestock, will be exceeded, Nebraska Department of Agriculture spokeswoman Christin Kamm said. In Iowa, after Gov. 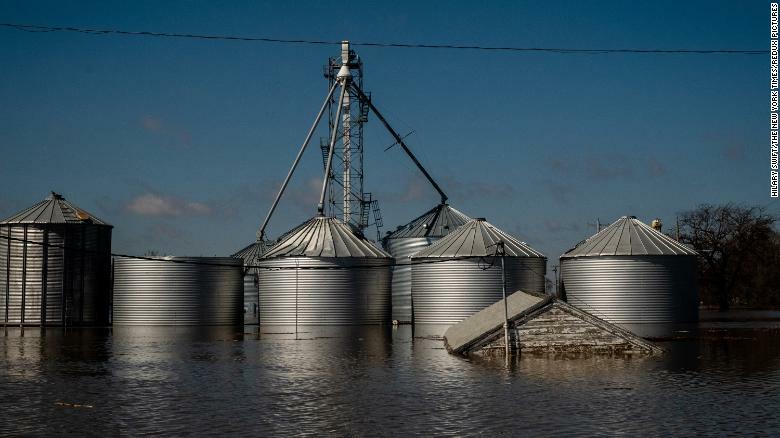 Kim Reynolds flew over flooded farms in a helicopter, she said she could see only the tops of grain bins sticking out of what looked like an ocean. Farmers and ranchers have been especially hard hit. 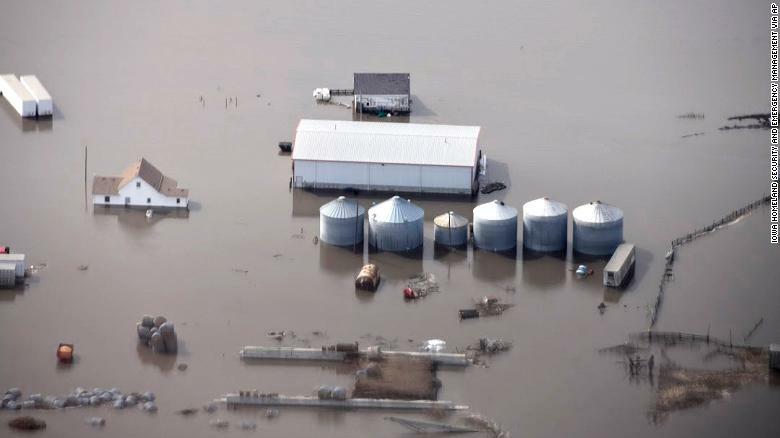 In rural eastern Nebraska outside of Omaha, farmer Eric Alberts told CNN affiliate WOWT that about 700 of his hogs drowned, many in his barn.He was trying to move his animals when the waters started rising last week.”Within 30 minutes, we had over 2 feet of water come through the front barn, and just swells were coming, and we barely made it out of here,” leaving most of the animals behind, he told WOWT. The fate of other animals is a mystery. Sheldon, the Iowa farmer, said Wednesday he knows of six facilities holding about 3,000 pigs each — and no one was immediately able to reach the flooded buildings to see how the livestock fared.Rescue groups have tried to help in some cases. Over the weekend, Iowan Scott Shehan crossed state lines to help ferry donkeys and ponies to dry land. 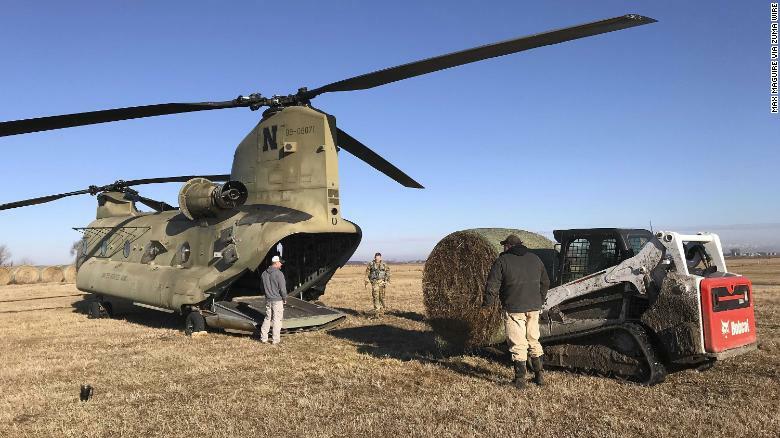 In one of his Facebook videos, rescuers used a makeshift floating platform — pushed by an air-boat — to get a pony out of a stranded portion of Sycamore Farms in Waterloo, Nebraska, on Sunday. In Iowa’s Fremont County, Sheldon’s farm supports three families. Floodwaters got into their bins, ruining about 75% to 80% of their stored crop.He estimates that’s hundreds of thousands of dollars of revenue lost — money that now can’t support the families or pay the farm’s expenses.Farmers commonly store the harvest and sell portions throughout the year, sometimes to wait for better prices in the spring. In that same county, farmer and fire chief Dan Sturm spent a chilly Wednesday morning wrestling with numerous problems on one hour of sleep in the small community of Hamburg.Flooding knocked out water service in the tiny city, and he and others were trying to pump water — shuttled from other towns in tanker trucks — into the water system so residents could use it for bathing and flushing while awaiting a more permanent fix.His farm wasn’t flooded — he lives on high ground. 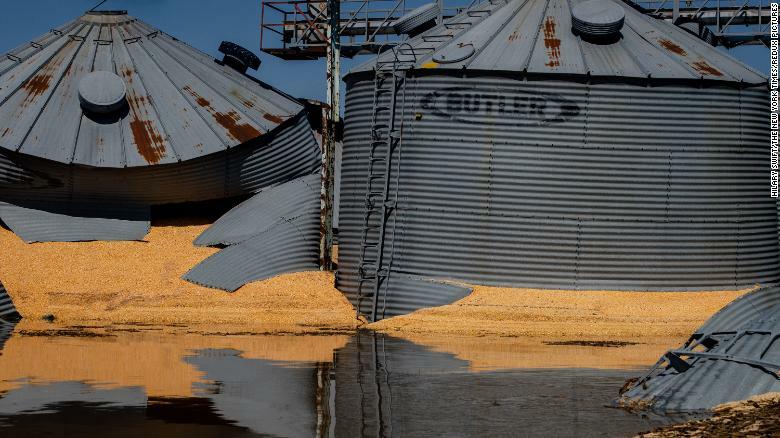 But he knows many farmers in the area whose bins — storing thousands of bushels of corn and soybeans — were deluged.One bushel of corn sells for about $3.40. So just 10,000 ruined bushels means around $34,000 in lost revenue.Lost harvests aren’t the only problem. It’s unclear whether the fields will be good for planting this year.”More than likely, they will not be able to put in a crop this year,” because of flooding now, and because “we will not have time to do any levee repairs to protect this year’s crop,” Sturm said.This already was a financially challenging time. Midwestern farm bankruptcies were up 19% in 2018 from a year prior, and at the highest level in more than 10 years, according to the American Farm Bureau.Market conditions have been tough. Soybean sales have slowed through a trade war with China, a top buyer. Corn cash receipts have been below a 10-year average for four straight years, the American Farm Bureau says. There are insurance products that could help farmers — if they had them.First, consider the revenue farmers will lose if they aren’t able to plant this year. About 90% of Iowa’s tillable acres are covered by crop insurance, and many of these coverage’s guarantee some revenue when planting is prevented, said Steven Johnson, a farm management specialist at Iowa State University.On one hand, the guarantee is limited. Such policies typically will pay 55% of covered corn revenue and 60% of soybean revenue, he said.On the other hand, a farmer who can’t plant won’t have to spend on seed, fertilization or harvesting.Second, look at the ruined crops in storage. Since they’re harvested, crop insurance doesn’t cover these.But some farmers will have a separate, blanket policy that covers buildings, machinery, equipment and stored crop, Johnson said.Even if farmers do have this separate policy, that doesn’t mean they won’t suffer losses.A $2 million blanket policy, for example, may have a $10,000 deductible the farmer pays out of pocket, Johnson said.Federal programs also can assist. The US Farm Service Agency offers money to livestock owners who’ve lost animals because of weather. It also offers funding to help them rehabilitate land damaged by natural disasters, in addition to emergency loans.Sturm, the fire chief and farmer in Hamburg, said some farms could be destroyed financially if they deal with both loss of stored harvest and inability to plant this year.”There’s many farmers that are not going to know what to do. They’ll probably look for some type of assistance, (but) it’s simply going to be devastating,” he said.